I have been enjoying Nonni's Biscotti for the past few weeks. Let me tell you they are YUM! My personal favorite way to eat them is next to a hot cup of tea. I've tried all 4 holiday varieties and they are all yummy but Cranberry Cioccolati didn't make it in my house more than a day. I didn't share that box with anyone else! 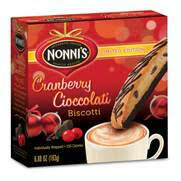 One lucky win 4 boxes of Nonni's Biscotti featuring these fabulous flavors! 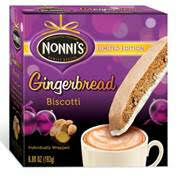 The Nonni’s Gingerbread Biscotti sound amazing to me, especially around the holidays! I'm most excited bout the flavor Nonni’s Caramel Apple Biscotti. I've actually got a box of Cranberry Cioccolati in my cupboard that I'm dying to try! The other flavors all sound delish as well. 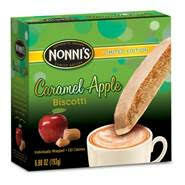 I would love to try the Nonni’s Caramel Apple Biscotti. I am excited about the Cranberry Cioccolati flavor. I'm most excited to try the Toffee Almond Biscotti flavor. I am most excited about the Nonni’s Caramel Apple Biscotti i love anything Caramel flavor. I'm most excited about Nonni’s Caramel Apple Biscotti. 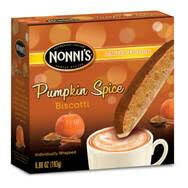 I am most excited about the Nonni's Pumpkin Spice Biscotti. I would say the Caramel Apple Biscotti, it sounds delicious. Thanks for the chance to win.